The best trees to control soil erosion have deep root systems that can grow down into the subsurface of the ground and grip the slope or hillside. Many different tree species are deep-rooting and appropriate for erosion control. The best strategy is to plant a mixture of trees, shrubs, plants and groundcovers to control soil erosion. Many fir trees have deep roots that can help to control erosion, especially the grand fir (Abies grandis), subalpine fir (A. lasiocarpa) and noble fir (A. procera), which are best for dry soils in full sunlight. The grand fir is hardy down to -30 degrees F. and can grow to more than 200 feet tall with flat sprays of needle foliage. The noble fir is a large tree that reaches a mature height of 50 to 100 feet and 30-foot spread with a pyramidal crown with horizontal branches. The noble fir grows best in USDA hardiness zones 5 and 6, where minimum annual temperatures can dip down to -15 degrees. The subalpine fir grows up to 90 feet tall with a conical shape and endures temperatures down to -50 degrees. The cascara (Frangula purshiana), also called the cascara buckthorn, is an erosion-control tree for dry to wet soils and full sunlight to shady areas. Slow-growing and with coarse, dark-green, dense foliage, the cascara tree reaches a mature height of about 35 feet and is most appropriate for climates with slightly milder winters. The cascara tolerates winter temperatures down to about 0 degrees. The big-leaf maple (Acer macrophyllum) is an erosion-controlling tree that’s best for dry to wet soils and full sun. This deeply rooting maple tree quickly reaches a mature height of about 60 feet and can withstand winter temperatures down to -10 degrees. The vine maple (A. circinatum) is a better maple for controlling erosion in wet to moist sites that are shady, growing up to just 20 feet tall. Slow-growing and with dense foliage, the western red cedar (Thuja plicata) is best for controlling erosion in dry to wet sites with full sunlight exposure. The western red cedar tree grows up to 150 feet tall with a conical shape and tolerates some shade. This deep-rooting tree can withstand winter temperatures as low as -30 degrees. Pine trees also help to control erosion with their deep roots, particularly the lodgepole pine (Pinus contorta var. latifolia) and ponderosa pine (P. ponderosa), which grow best in sunny areas with dry soils. The lodgepole pine has a short, narrow, conical crown and grows up to 80 feet tall and 20 feet wide, thriving in USDA hardiness zones 4 through 8 (minimum temperature of -25 degrees). The ponderosa pine has a narrow, cylindrical, irregular shape and grows 60 to 100 feet tall with a 30-foot spread, appropriate for zones 3 through 7 (-35 degrees). 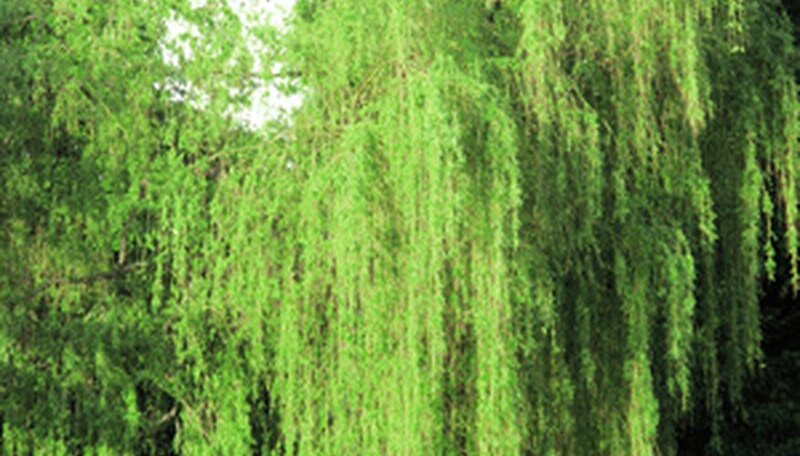 Willow trees, particularly the weeping willow (Salix babylonica), have deep, vigorous roots and are best for wet to moist, sunny areas. With an open crown of weeping branches that touch the ground, the weeping willow grows best in zones 6 through 8 (-5 degrees), reaching a mature height of just 30 to 40 feet and spread of 35 feet.